Treasures in the deep versus life in the Milky Way. 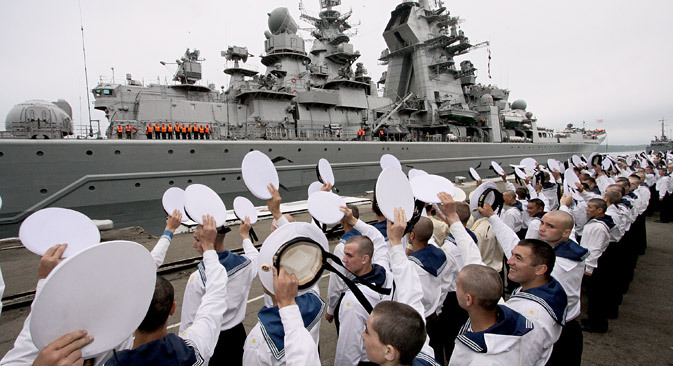 As the nation celebrated Navy Day on July 26, the Kremlin announced that Russia will strengthen its naval forces in response to NATO moving its bases closer to the Russian border, the BBC reported. At a ceremony in Baltiysk, a major naval base in Kaliningrad, Russian Deputy Prime Minister Dmitry Rogozin said: "The main emphasis is in two directions - the Arctic and the Atlantic". The northern navy will get a fleet of new icebreakers and much more: Moscow is already constructing 10 air-defense radar stations, 10 search-and-rescue stations, 13 airfields and 16 deep water ports across its Arctic coast to establish military superiority in the region, Business Insider reported earlier this month. Russia also aims to double its military forces on the Novaya Zemlya archipelago in the Arctic region by 2020, it was previously announced. Lucrative reasons guide Russia’s developments in the Arctic: the region’s largely untapped reserves of oil, gas, minerals, fresh water and fish - as well as a possible trade route between Europe and Asia, make it a site of major attraction for all bordering countries. Liquid gold of another kind is on the minds of those taking part in a friendlier contest - Tatarstan capital Kazan is hosting the FINA world swimming championships. Nearly 3,000 athletes from 191 countries compete in the 16th edition of FINA, from July 24 to Aug. 9, with some of the most showy and spectacular sports to watch— from synchronized swimming to high diving, and water polo. The event kicked off on July 24 with a spectacular opening ceremony that some commentators said would not put the Olympic Games to shame. On July 26 the first-ever world’s mixed synchronized competition was held: male and female duets competed in what might soon become the aquatics equivalent of couples figure skating – a visually stunning combo of drama and technical advancement. It comes as no surprise that the winners of the competition are professional artists: Cirque du Soleil performers Bill May and Christina Jones became the first-ever holders of world champions title: a couple from the U.S. will now be aiming for 2020 Olympics, should the discipline be included in the official Olympic program by then. Russian billionaire Yuri Milner badly wants to know if humankind is alone in the universe. So much so, he is willing to shell out $100 million to fund Breakthrough Listen Initiative aimed at discovering life beyond our planet. The 10-year project will scour a million of the closest stars to Earth for faint signals of intelligent life, The Royal Society in London said on July 20. The project is backed by the celebrity scientist Stephen Hawking, and will put to use two of the planet's most powerful and sensitive radio telescopes and sophisticated receivers that can scan billions of radio frequencies simultaneously. It will survey 10 times more of the sky, cover five times more of the radio spectrum and work a hundred times faster than any previous program, says the Daily Mail. Milner has a fondness for real estate and round figures: $100 million is also the sum he paid for his luxury Californian estate four years ago, at the time the most expensive piece of domestic real estate in America, according to the Luxury Society. Russian students Varvara Karaulova and Mariam Ismailova have made headlines, suspected of leaving Moscow to join Islamic State terrorists in Syria, the BBC says. Their case is far from unique: Russia's Federal Security Service estimates that Russian passport-holders could account for a staggering 8% of IS fighters, and currently about 2,200 Russians are taking part in military operations in Iraq and Syria. Russian has now become the third most used language within IS's self-proclaimed caliphate, after Arabic and English. Though most of the recruits come from Dagestan, young people from many regions appear to be prone to IS marketing efforts. However religious propaganda is not the exclusive preserve of Islamic extremists: Vedomosti reports that the millennium of the death of Vladimir the Great, who brought Christianity to Kievan Rus, is to be made an official celebration in Russia. A billion rubles have been allocated from the state budget to the Russian Orthodox Church and other organizations for lavish celebrations. Vladimir was known for his cruelty, political intrigues and lechery, and most probably adopted Christianity in a calculated strategic move so to improve diplomatic relations with the Byzantine Empire, the newspaper notes. It was the prince’s success in bringing together the independent princedoms under the rule of the centre, which must appeal to the state today, the paper adds. Why are ordinary Russians joining the ranks of Islamic State?